SPECIAL NEWSLETTER: Practicing Paryushan / Das Lakshan - Resources, Tips, & Updates! Paryushana is the most important Jain religious observance of the year. For both Shvetambars, who observe the festival over a period of eight days, and Digambaras, for whom Das Lakshana lasts ten days, this is a time of intensive study, reflection, and purification. The word "paryushana” literally means "abiding" or "coming together." During the middle of the four-month rainy season in India, Jain monks and nuns cease moving from place to place and stay with one community. Below, you will find information on news, tips, and helpful resources to deepen your practice of Paryushana. Have you ever wondered about the true meaning of Pratikraman? In this presentation, former JAINA president Anop Vora aims to improve our understanding of the Pratikraman Ritual at the macro level, which can help us alter our thought patterns and behaviors for the better. He explains the meaning of Pratikrama, its various types and formats, as well as how it is observed by different traditions within the Jain community. To view the presentation, please click on the image to the left. Looking for a simple Jain or vegan recipe to try out this Paryushan/Das Lakshan? Want to know what ingredients to avoid at the grocery store? Take a look at our new Jain Recipes section on the YJA website. The list is growing, and we’d love to hear your recipes! If you have recipes or tips to share, e-mail JAINA at info@jaina.org. Are you in the New York City area? Want free, delicious, Jain meals for Paryushan? Register here to receive such meals. As we continue our practice of nonviolence, something to consider would be to give up dairy and animal by products during this Paryushan. It is an unfortunate truth that our consumption of dairy products leads to the immense suffering and killing of innocent cows. In light of this, it seems reasonable that Jains should acknowledge and consider the suffering caused to cows in the milk production process when undertaking pratikaman. JAINA is proud to announce Forgiveness Day on Sept 13! The practice of seeking forgiveness and forgiving others is a critical aspect of Jain practice. In the spirit of expanding awareness of Jainism, we are in the process of creating official days of observance for the Jain community and beyond. Stay tuned for more information about Forgiveness Day as well as other JAINA Days: Non-Violence Day (Oct 2) and Compassion - Jiv Daya Day (Nov 28). For News Release click here: jaina.org/celebratingforgiveness. 3. 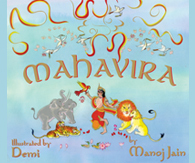 Teaching kids compassion - Get your copy of the Mahavira Childrens' Book TODAY! Just as children read about and watch superheroes, like Spiderman and Batman, they need to be exposed to spiritual heroes, like Buddha, Jesus and Confucius. 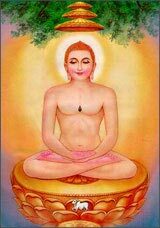 Mahavira is one such spiritual hero who preached the principle of ahimsa, nonviolence, towards all. This story brings this hero to light for young readers and helps them recognize the universal power of nonviolence. This story helps the older readers realize that we are all on a spiritual journey. Mahavira is one of the many great spiritual heroes, and while few know him name, everyone knows his philosophy of ahimsa, nonviolence, as practiced by Gandhi and King. This book helps young readers learn about the roots of ahimsa in an ancient tradition. This book complements the many other pieces done by Demi, including Buddha, Krishna and Confucious. This is wonderful gift for any child or parent who is passionate about the message of nonviolence. Get your copy today for $14.99 by simply clicking on the order button to your left. The JAINA 2015 Convention website is NOW OPEN FOR REGISTRATION! If you have never been to a JAINA Convention, this is an event not to be missed. This will be the 18th Biennial JAINA Convention held in Atlanta, GA July 2-5, 2015. Nearly 4,000 Jains from across the globe, ages 7 to 70, will gather under the theme "Jainism: World of Nonviolence". It will feature religious and spiritual discourses by prominent Sadhus, Sadhvijis, & Scholars to inspire the audience on Nonviolence. There will be multiple tracks for interactive sessions across all age groups, opportunities for professional networking, and much much more! This is the first JAINA convention held in Atlanta representing the South East Region and will be held at the Georgia International Convention Center (GICC). For more information visit http://convention.jaina.org.